The Dictionary defines Heretic as a noun meaning either: (1) a professed believer who maintains religious opinions contrary to those accepted by his or her church or rejects doctrines prescribed by that church; or (2) anyone who does not conform to an established attitude, doctrine or principle. Such is the new Diamond Heretic. Built with the same quality construction and components, the Heretic provides a thunderous, full gain tone that’s open, precise and hits you in the chest like a sledgehammer. With a similar gain style to the very tight but powerful Spitfire 2, the Heretic picks up where the Spitfire 2 leaves off. It features a clean channel and two distinct high gain settings in Channel 2. 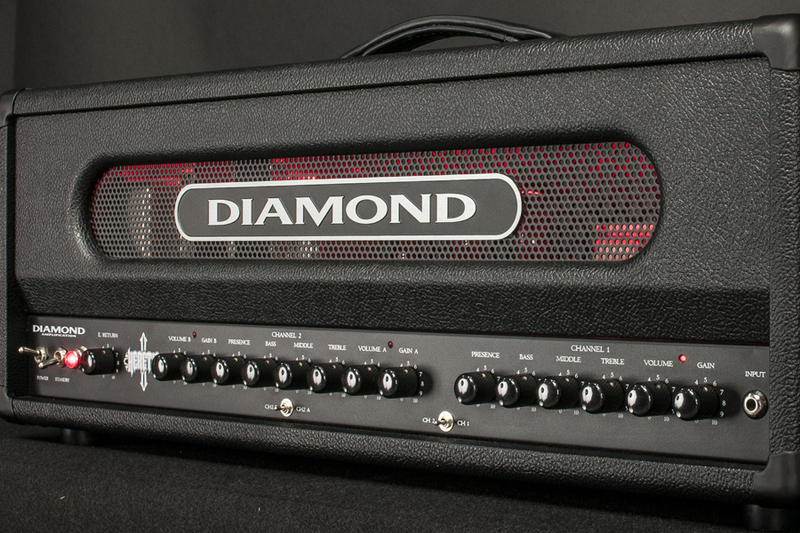 The rear panel of the Heretic also features Diamond’s dialable “deep” function to vary low-end resonance. The Heretic also features a real, correctly-designed effects loop. You don't need a foot switch; you don't have to push a button. Just plug a cable into the effects send and the loop activates. The loop is tube buffered and will not affect your tone. Like all current and future Diamond Amplification products, the Heretic features the highest quality components and construction. Every component was selected and tested for this head. The Heretic uses 6 12AX7 preamp tubes and 4 Sovtek 5881's for its power stage. Each part was personally spec'd and tested by us to ensure maximum performance and reliability, from the transformers to the switches and knobs. The head features a perforated metal grille inset in a Tolex wrapped front panel, and an accompanying black grille on the back finished in black powder coating. Even the knobs are metal for look and feel. LED's are mounted in the box to give this head its distinctive red glow. Corner irons are included on every corner to add to the strength and stability of the box. All its channels are foot-switchable from the Heretic's footswitch (connected with a stereo cable). Red LED's light the box for a distinctive look on stage, along with a unique silver vein front grille and etched zinc logo.